Oh the dog days of summer. What’s not to like about summer? Vacations, cookouts, swimming—can it get any better than that? Wait a dog gone minute though. These fun times can be hazardous to your pets, so care must be taken to make sure that they don’t succumb to the dangers that can be lurking. Accidents can happen almost anytime and anyplace so it is important to be aware of how to prevent them from happening. These can include but not be limited to heat stroke, swimming pools, venomous pests, campouts, bbq and other foods just to name a few. So let’s cover a few dangers to avoid and try to prevent. The summer heat can be dangerous to our pets. 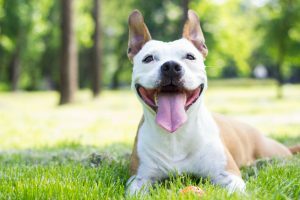 Dogs are covered with hair, have very few sweat glands, and some breeds have shortened noses that make it tough to keep cool in the summer. So the easiest way to beat the heat is to adjust your walking schedule to the morning hours when it is cooler out. Some dogs may do well with having their haircoat shaved, however breeds like the Husky have a haircoat that also helps keep them cool in the summer. The heat will also warm up the inside of your car, so if it is above 65 degrees either leave your pet at home or take it inside with you when you leave the vehicle. Sunburn can also cause some problems, so it may be important to put sunscreen on the pets ears and bare skin to prevent this. What is a better way to beat the heat than swim in a swimming pool? 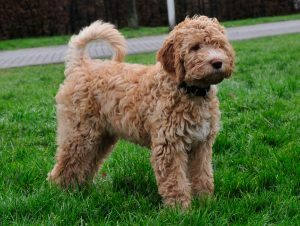 It is great and it also is a good way for your dog to get exercise. 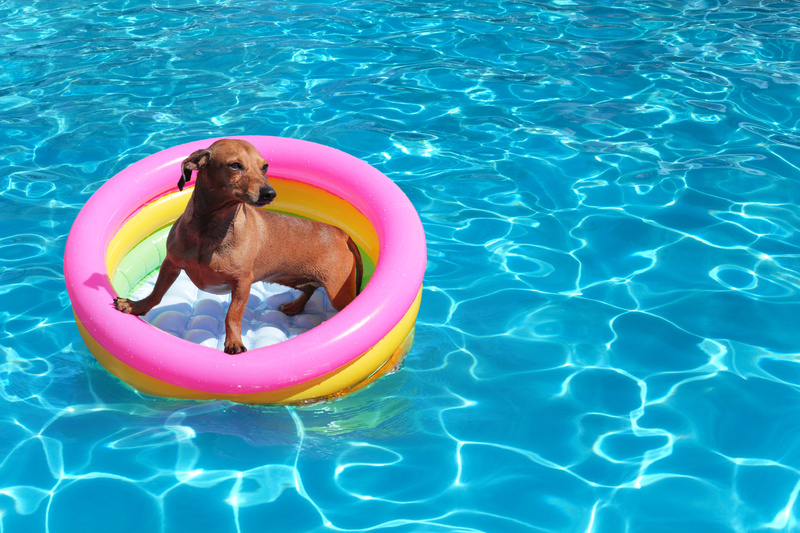 Floatation devices are available to assist the pets that are not strong swimmers. But, do not leave them unsupervised. It is important that they be taught how to exit the pool safely before they tire. Also having fresh water for them to cool off with and to remove the chlorine, salt and bacteria that can be harmful to them is beneficial. So keep a bowl handy by the pool. Almost everyone celebrates the Fourth of July with fireworks. Dogs tend to not like loud noises and can be scared easily. The best advice would be to leave your pets at home inside and away from the flash of the fireworks. Some summer evenings are spent socializing with friends and barbecuing. We all like them, and even our pets are hoping for a few table scraps. A little of this and a little of that can be bad for pets—and not just their waistlines. Some surprising foods like grapes, onions, garlic and raisins, can be toxic to dogs if consumed in large quantities and should stay off their menu. Other barbecue staples like corn on the cob, bones, fruit with pits, skewers or ice cream can be dangerous to our four-legged family members. It may be helpful to talk to guests and children before summer parties and politely remind them that table food could be detrimental to the health of your pet. While our the heat puts a strain on our pets, fleas and ticks thrive during this time. 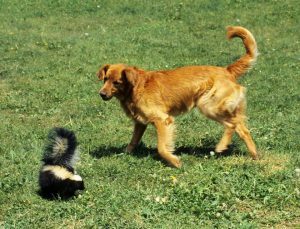 They can cause disease and carry other parasites that are detrimental to the health of our pets. Just like humans, pets can have allergic reactions to insect and spider bites. By grooming your pet frequently, you can check for the presence of the pests, hot spots, and other skin problems that can be caused by these pests. There are some very good flea and tick medications out there to prevent the problems before they start, so talk with your veterinarian to see what they would suggest. 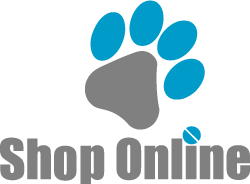 You can also order directly from our store. Heartworms are carried by mosquitos, and the summer months are when mosquitos thrive and pose the greatest threat to your pet. The heartworms can be very dangerous to the health of your pet. It is best to have your pet on a medication to prevent your pet from contracting the painful disease. So ask your veterinarian for their recommendations. These dangers may sound scary, but a little preparation and watchful eye is all you need to take the heat off your summer. If you have any questions, please don’t hesitate to call the Olsen Veterinary Clinic at 618-656-5868, or contact us here. Oh, the sounds of summer! Many people and their pets will spend numerous hours this summer basking on a beach, boating in a lake, or even lounging by a pool in their own backyard. Many pets love being around water, but each year approximately 40,000 pets lose their lives in drowning accidents. You need to look out for your pet around water, since even the strongest, most enthusiastic swimmers can get into trouble. 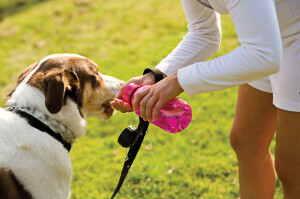 The keys to water safety for dogs are prevention, preparedness and awareness. Believe it or not, not all breeds are Micheal Phelps-type swimmers. For example, the Bassett Hound and English Bulldog just are not built for swimming, so it is important to have a secure fence and gate around your pool and never leave your pet unsupervised. Make sure that your pet can get out of the pool. If it jumps or falls in, it may panic and drown. Even the strongest swimmers can tire easily. If you are taking your pet boating or in a river or ocean, it may be wise to invest in a dog floatation device and use it. Just like people, it’s easy for your pet to develop a cramp and become exhausted too far from shore or get overwhelmed by the tides. Since pools are filled with chemicals that control the water and algae, and lakes and ponds can be a common source for parasites, it may be a good idea to bring fresh drinking water for your pet. The chemicals and parasites can cause your pet to become ill, which may lead to vomiting, diarrhea and other health issues. One of the best things that you can do is to take courses in pet first aid and CPR. These are available at many local Red Cross chapters and sometimes taught by a local veterinarian. A near-death dog rescued from the water may be saved by your prompt actions—if you know what to do. As I mentioned before, if your dog isn’t much of a swimmer or is older and debilitated, get him a personal floatation device. These are especially great for family boating trips, because most have study handles for rescue when a pet goes overboard. It is also important to keep a long leash on the boat at all times in case you need to restrain your pet for any reason. It is also important to bring fresh water to rinse off your pet after swimming to get out the chlorine and other pool chemicals, as well as bacteria and dirt he might get on him from an ocean or lake. Don’t let your dog sit in a wet collar as hot spots can develop as well. Be particularly careful with young and old dogs. Young dogs can panic in the water and old dogs may not realize that they aren’t as strong as they used to be. Keep them close to shore, and keep swimming sessions short. During the hot summer, many dogs are drawn to water to cool off and swimming also meet your dog’s exercise needs with a low-impact option of movement. But accidents can happen in a hurry. So try to prevent these accidents by being prepared and aware. If you have any further questions, please feel free to contact us.